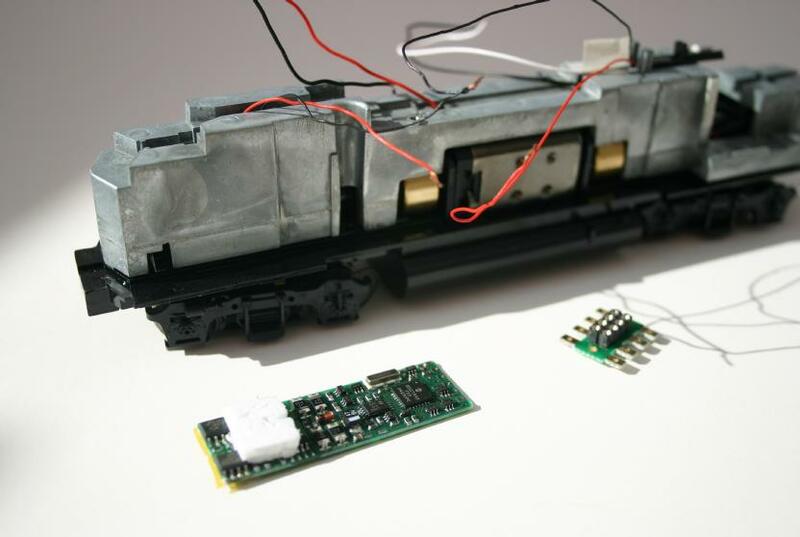 While generally the US model scene seems content with just the standard 8-pin NMRA standard connector, the European scene has also long had the NEM-651 6-pin connector for use in N-scale locomotives obviating the need for a custom shaped PCB board replacement decoder. Recent times have seen the desire for a better connector standard produce a new 21-pin connector known as PluX22 (see comments for more info). 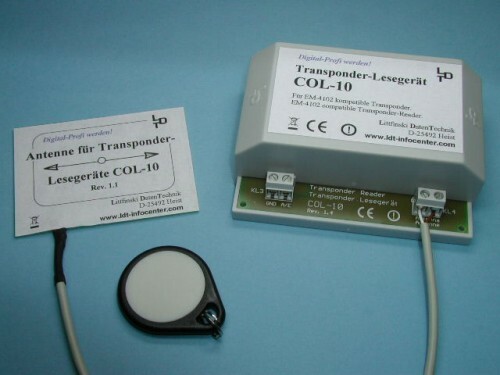 This decoder connection includes many more function channels for interior lights, classification lights, speakers etc. This connector is now getting quite common on European (including UK) models. 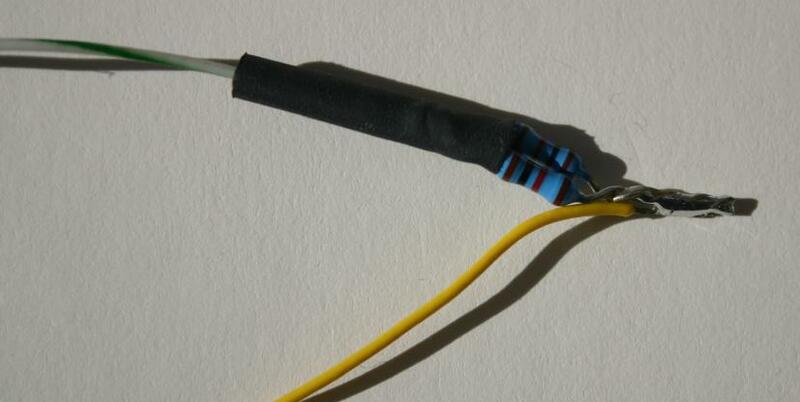 Much less known is it’s N-scale equivalent, the NEM-658 PluX-12 connector. I’ve just ordered a loco – a model of the very common DBAG (German Railways) class BR218 Diesel locomotive – which features this connector. So far my efforts to find out more have come to nought. Simply searching Google for NEM 658 or PluX-12 produces loads of foreign language responses. Even asking Google to restrict results to English produces nothing relevant and in fact actually even in English on the whole first page of results – a pretty epic failure. So I’m going to use this blog entry to try and do something about that and to record my efforts to find out more and to get a suitable decoder for this locomotive…. Update: The only current decoder with this connector appears to be the CT Electronik DCX51-P12 but apparently this doesn’t fit some of the Tillig locos due to being too wide. The next hope is that ESU have announced one but I don’t if it’s available yet. Apparently a six-pin decoder can also be used if it has right-angled pins…. none of the ones I’ve seen do, but maybe they can be bent into shape. If you are looking for manuals for Uhlenbrock modules you are in luck! It looks like they have a pretty complete collection of manuals in PDF format online now. 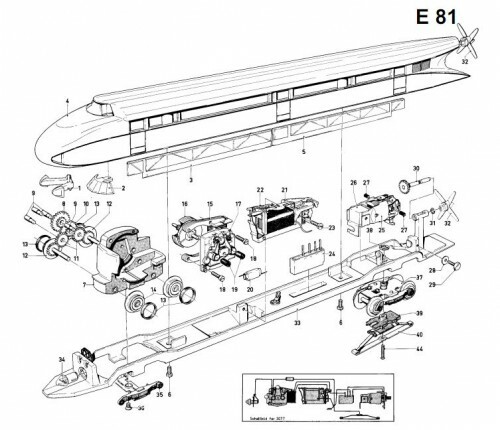 That previous site mentioned also has pages for all kinds of Märklin digital conversions, including this nice page on the 60903 and 60923 upgrade kits. These two conversion sets are identical when it comes to the five-star high power motor itself. The big difference is the digital decoder. 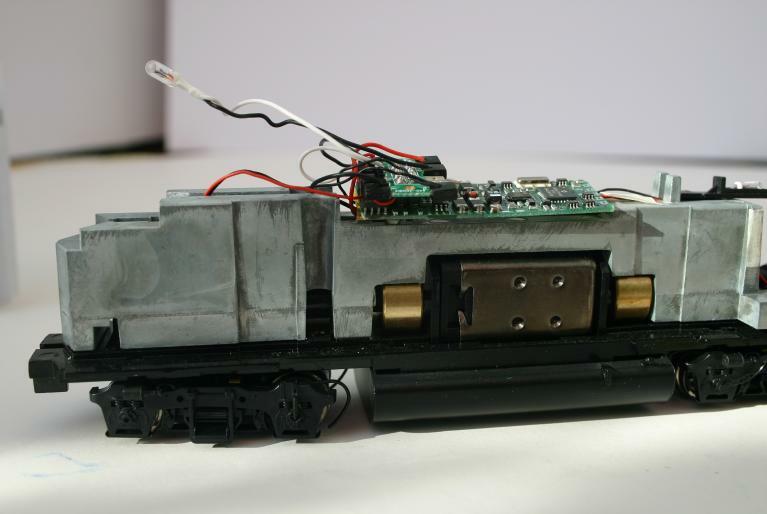 In the 60903 it was (not produced anymore) a so called c91 decoder, with a row of eight switches to set the decoder address and two potentiometers to adjust the maximum locomotive speed and the acceleration and deceleration time. In the 60923 we find a mfx decoder. It means, among others, that the decoder is adjusted from outside, from the train controller. You can set a lot of things, like the address (if you use a Delta controller or the 6021 Control Unit), the maximum speed, which can be set rather accurate, the acceleration and deceleration time can be set individually and you have some control of the different functions of the decoder. via 60903 and 60923, and the main site. I found this interesting page documenting the conversion of a Märklin 3145 SNCF Y 50 101 to Digital using the 60670 set. Lots of nice pictures and they also show how they moved to LED lighting which allowed the forward/reverse lights to work correctly. They also note that this can be done on all the models based on the BR V36/236 – including locomotives from the sets 2846, 2848, 28502, the 3145 and the double locomotive 3346. 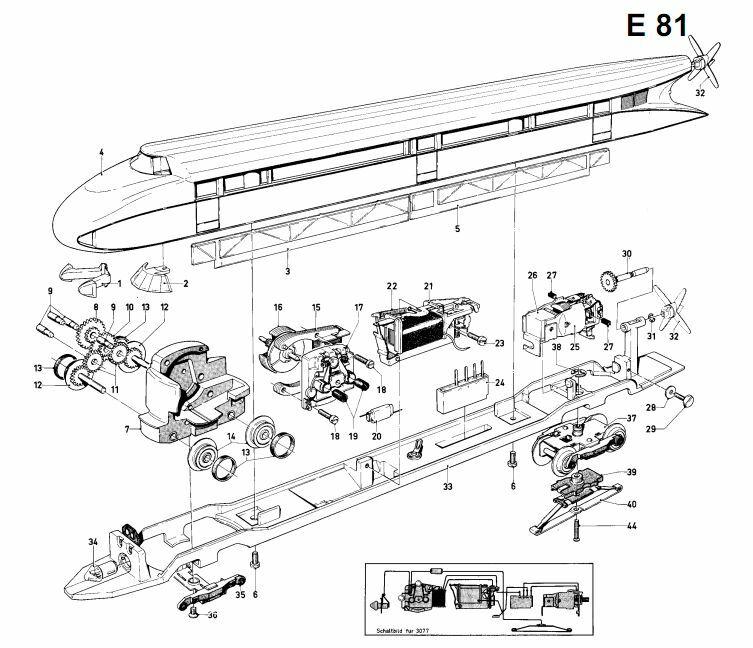 Recently I was looking for the exploded view of a locomotive that I was upgrading for Digital operation. Märklin has a nice site for this purpose, though it is all in German so keep that in mind. That said it is pretty easy to work out how to use the site. Check it out at http://www.maerklin.de/de/service/suche/ersatzteile.html. Wheel Spacer (Back to back) measuring / setting tool for H0 wheels. The tool is supplied with 2 spindle points, one for locomotive wheel setting and one for wagon/carriage wheels fitted on pin-point bearing axles. Price	EUR 26,00 (incl. VAT, plus shipping and handling) – see it at fohrmann online. 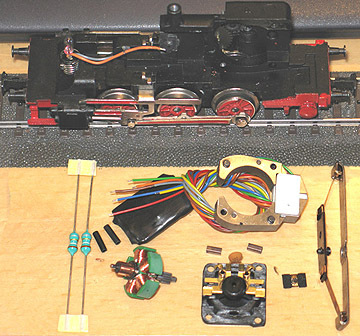 Rail Gauge for checking DC models (14.3 mm) and Märklin (13.8 mm). Aluminium construction. Price	EUR 14,80 (incl. VAT, plus shipping and handling) – see it at fohrmann online. These little tags that are passive until excited by a reading antenna can not only tell you that a train is at the location, it also tells you which train it is. It looks like a company called Littfinski DatenTechnik is leading the way with a small range of RFID products. While this technology looks pretty interesting, it is still in early stages. And at 4 Euro per ID and 90 Euro per detector, it is not cheap. Still something worth keeping an eye on I feel! A friend of mine pointed me to these interesting control components for switches etc. using compressed air. There are a number of designs suitable for converting turnouts from LGB and other garden rail manufacturers. There are also under table versions suitable for inside layouts in smaller scales, though the ruggedness of these parts makes them most interesting for outside use on G scale tracks. While primarily intended for track switches, these controls can be used for pretty much anything that moves. Lifelike Products Inc make a number of HO-scale (1:87) models of the EMD GP38-2 (Geep Diesel Electric Road Switcher Locomotive). This article is my attempt to write about installing DCC on these locomotives – it isn’t a particularly simple task. DISCLAIMER: This modification is hard. You can damage your new model VERY EASILY with the tools needed to perform the modification. 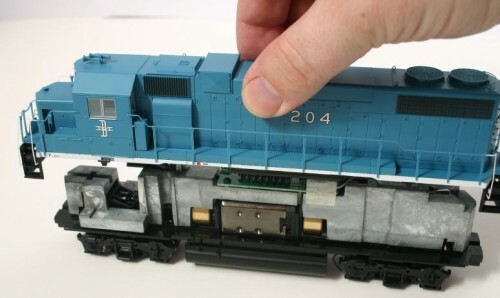 These instructions are designed to make the process easier, and are based upon the successful modification of no less than eight Proto 2000 GP38-2 models. However we can accept no liability for what happens to your model, nor do we guarantee that this modification will work. If you undertake the modification detailed here, you do so entirely at your own risk. Remove it from it’s box – collect up the detail parts that have fallen off in shipping. Remove the two support brackets that hold it in place for shipping. As ever with a DCC install, always check the loco runs correctly on DC before even starting the install. After that it should prove reasonably straightforward to just remove the shell of the loco. You’ll be left with the Chassis looking like this. The tidy look and apparently open connector belies just how much work lies ahead to get this thing to actually work right with DCC. After bad experiences with a melted roof, I’d say you have two choices at this point – replace all four bulbs with LEDs, or use a DCC decoder with a low current/low voltage output such as the Digitrax DH165L0 (or the previous non-RoHS DH163L0 if you find one on a dealers shelf) or TCS A6X decoders. After my bad experiences with a Lenz LE1035 (due to the appalling vagueness of the Proto 2000 manual leading me to fitting the wrong type of replacement bulbs), I found the DH163L0 decoder intended specifically for this breed of Proto 2000 unit. Unfortunately this only caters for the headlights using the factory fitted bulbs; works fine on the Proto 2000 USRA 0-8-0 and probably GP30 etc, the four bulbs of the GP38-2 model present a problem. The headlights are catered for, but the two number board lights are not; I replace them with LEDs since the bluer colour is much less of a problem when shone through the numberboards. Since I did the first batch with DH163L0s, I’ve continued with this chip, although the more recently released TCS A6X with it’s six balanced low voltage outputs would save any need to replace bulbs (but would be a little bigger (awkward) and would require a completely socketless install). If you pull off the push-on plastic caps, unscrew the main PCB from the chassis, you’ll be left with it looking like this – the Digitrax DH163L0 board is visible in front. At the right hand end of the Digitrax DH163L0 decoder, you should be able to see five little holes in the DCC PCB. These are the solder points for the additional functions. I’m pretty certain (please check) that the centre one is the blue/+Common (function common) and one of the points just next to it is the F1 output. I then build a small wiring loom which consists of a wire that will run in the channel under the PCB towards the front of the loco. There is a reasonable cavity just under where the cab will be where the resistors for the number board LEDs can be placed. I therefore bring the function common forward to this location where I place a little package of two 1K 1/6th watt resistors wired in parallel. This gives 500 ohms which is about right (I’m told) and using two smaller resistors in parallel creates more surface area to disapate the heat generated. (Least that’s my theory; remember, melted roof first time, I’m nervous about where the heat goes!). One leg of the front number board LED is soldered to the end of the resistor pack (but only after testing the basic install because I’m no good at telling which pin is which on an LED – I prefer to offer it up and see it shine before soldering it in!). A return wire back under the DCC PCB takes the low current feed back to the rear of the locomotive for the rear number board LED. At this point in the install, the light started failing me and I completed the install on B&M #204 by artificial light and couldn’t take any more photos worth sharing. I now have three more units to do and will photograph the next stages of the process as I do those. Here is a diagramme that tries to explain how the extra components are added to make the LEDs work. 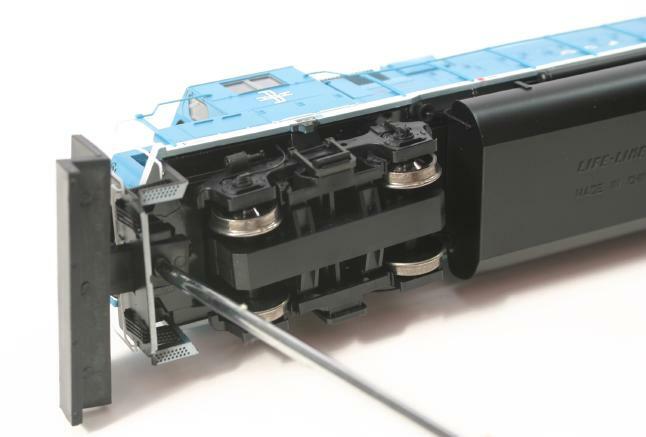 Note that the best place for the resistor package to fit is in a gap in the chassis in front of the DCC board near the cab (under the dynamic brake blister on the model). The extra wiring loom carrying it left of the board is to indicate approximate lengths of the needed cables, layout, etc. Quick Summary: Basically you re-wire the 8-pin connector such that the normal pins are connected – pickups to power in, motor to the two motor pins – F0-Front to the front headlight, F0-Rear to the rear headlight. Do the usual safety tests on the programming track, set the address and check it runs. reassemble the loco. Note that the position of the light pipes is such that one LED is on top, while the other is below the bulb. This weekend (January 30-31, 2010), the Eastern Massachusetts Chapter of the European Train Enthusiasts (ETE) is sponsoring a “EuroEast’10” event during the Amherst Railway Society Train Show in Springfield, Massachusetts. The venue is the Eastern State Exposition, Memorial Highway, West Springfield, MA. Details of the main show can be found at http://www.railroadhobbyshow.com/.